Have you ever wondered what the difference between a crystal and a mineral is? Perhaps you thought that there was none at all. Well, that is where you’re wrong – there are very significant differences between these two, and knowing them would help you differentiate one from the other. Shall we get started, then? Minerals are naturally occurring solid chemical substances. They are formed through various geological processes. All of them have very distinct chemical compositions, highly ordered atomic structures, as well as specific physical properties. Are rocks considered to be minerals? No, they are not. Rocks are simply aggregates of minerals or mineraloids, and therefore, they do not have the specific chemical composition one would normally find in minerals. In terms of composition, minerals tend to vary from simple salts, pure elements, to rather complex silicates that have about a thousand or so known forms. Over half of the known mineral species are actually incredibly rare; most have only been found through a handful of samples with some being known through one or two small grains of its species. Commercially, there are many different uses for minerals, which puts them among the most valuable, especially when it comes to industrial use. Most mineral products are either mined or grown. They have always been very important in various parts of the world, even in early societies, because of the different products that can be created from them. Minerals are considered to be some of the most important natural resources that a nation can have; throughout history, countries have invaded each other in order to take mineral resources from one another. Crystal, on the other hand, is a solid material comprised of ions, atoms, and molecules, which are then arranged in a repeating pattern that spans all three spatial dimensions. This process is what’s referred to as crystallization or solidification. Basically, crystals start off as liquid particles that eventually solidify. A good example of this is rock salt. The structure of the crystal itself depends upon the chemistry of the fluid from which it is formed. Another factor that must be considered is the ambient pressure. Whilst the cooling process guarantees the solidification process, there are instances wherein given the right conditions, the fluid may not crystallize, therefore keeping it in a frozen non-crystalline state. This creates a material that known as vitreous, amorphous, or glassy. Through the ages, especially in many of the ancient civilizations, crystals were often thought to possess spiritual properties. As a matter of fact, different kinds of crystals signify different energies that can then be harnessed through its use and through meditation. There have been studies into this phenomenon, and it has been proven that crystals do have some sort of effect on the human body. Some have a relaxing effect, while others promote better blood flow. 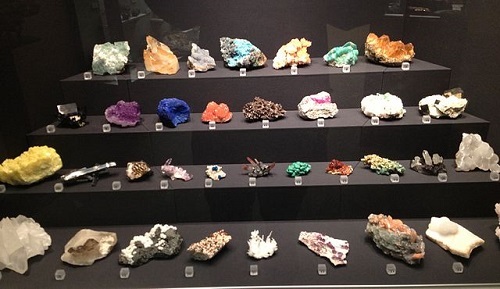 Crystals and minerals differ not only in the ways in which they are used, but also in terms of structure. To put it simply, a crystal has a structure made up of various natural materials, whereas a mineral is a material in and of itself. Two or more minerals can actually have the same chemical composition and yet differ completely when it comes to crystal structure; these are known as polymorphs. Crystal structure can greatly influence the physical properties of a mineral. A good example of this would be diamonds and graphite. As you already know, diamonds are known to be the hardest of all minerals, and yet, while it has the same composition as the graphite, the latter is very malleable in nature. 1.Minerals are naturally occurring materials, while crystals are comprised of a variety of different natural materials. 2.Rocks should not be mistaken for minerals. 3.Crystals can come in either solid or frozen non-crystalline state. 4.Two different minerals may share the same composition and yet vary greatly when it comes to crystal structure. Celine. "Difference Between Crystal and Mineral." DifferenceBetween.net. August 1, 2017 < http://www.differencebetween.net/miscellaneous/difference-between-crystal-and-mineral/ >. Greetings All! Could somebody with the research interest please help me. I am not scientifically trained so find the techno-language difficult. Q: Is NUUMITE[Nuummite? ], found ONLY in Greenland, by definition a true crystal ? Many thanks to anyone who can help. It is rather urgent!